Twenty years have passed since a DC-9 operated by budget carrier ValuJet crashed into the Florida Everglades, taking the lives of 110 people. 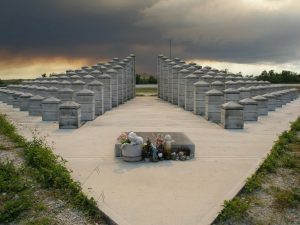 After months of investigation, the NTSB determined that an illegal shipment of uncapped oxygen generators (secured only by duct tape) fueled a cargo fire, including tires and other ValuJet company materials, and brought down the Atlanta-bound airliner shortly after takeoff from Miami International Airport on May 11, 1996. The NTSB never determined the ignition source that started the fire. The 110 victims who died that day suffered unimaginable pain, as did their loved ones. Yet as the families learned the details of what caused the crash and the organizational failures behind it, their grief transformed into outrage, and then, action. No airline crash is just an “accident,” and the crash of ValuJet 592 is no exception. The crash was not simply caused by an in-flight fire. The deadly fire was the result of improperly and illegally stored oxygen containers, which could have been safely transported with inexpensive, plastic caps, instead of duct tape. When it burned out of control, the plane was doomed. But this crash wasn’t just about the fire. The chain of events that set this crash sequence into motion began on the ground, with a lack of safety culture, training and oversight of ValuJet’s maintenance providers. The preventability of airplane crashes is what motivates air safety advocates and crash victims’ families. If plane crashes just happened like a statistical anomaly, we would have nothing to do but live in fear, waiting for the unlucky, inevitable event. But when examining all the facts and circumstances surrounding a crash, it becomes clear that crashes are preventable, and the only way to stop them from happening is to change behavior. To their great credit, the families of ValuJet Flight 592 have done more collectively to fight for change in aviation safety than the families of any other air disaster. At the close of its investigation, the NTSB issued 47 safety recommendations, some of which were adopted by the FAA, but many were not. The families worked with the National Air Distaster Alliance/Foundation (NADA/F) to press the NTSB for answers, and to get members of Congress involved. Through their perseverance in pushing for answers and change, significant improvements in flight safety have been made. Public exposure of the “dual mandate” of the FAA: both safety and promotion of airlines. In addition to problems at the airline and with its maintenance contractor, the NTSB blamed the FAA for its lack of oversight of ValuJet. Among other things, the NTSB concluded that the FAA’s Flight Standards District Office was spread too thin. ValuJet had grown from 2 jets to 52 jets in a very short period of time, and the FAA’s Principal Maintenance Inspector assigned to the airline had too many responsibilities to provide the needed oversight at ValuJet. There was also substantial political pressure to get ValuJet flying despite an alarming pattern of safety issues which had already caused problems and a fire before the fatal crash. After each crash investigation, the NTSB issues safety recommendations. It was sadly noted that the NTSB had recommended fire/smoke detection systems and fire extinguishment systems in cargo compartments in 1988, but those recommendations were not adopted by the FAA. Had the FAA adopted those recommendations, it is unlikely that the crash of ValuJet Flight 592 would have occurred. Twenty years later, the legacy of ValuJet Flight 592 lives on in the air safety improvements for which these families fought and won. Today we remember those 110 lives lost, and salute and thank their families for their unrelenting determination in making the skies safer. Mary Schiavo was the Inspector General of the U.S. Department of Transportation. Her commentary about the ValuJet crash was featured in Time Magazine and Newsweek. To learn more about the ValuJet crash, read her NY Times Bestselling book, Flying Blind, Flying Safe.